Currently only Cisco SPA series of Phones are supported in the Auto provisioning device list. For those phones not in the list but support SIP protocol, we can use PBX as DHCP Server and TFTP Server to provision them. Like Cisco 6,7,8 series as well as CP series. The basic idea is S-Series PBX works as a TFTP and Registration Server in the provisioning process. * Disclaimer: we don't offer the service to help convert the SIP firmware and build the configuration file. 2. Download the file and set user configurations. Note that we don't offer configuration file for customers. This part is rather technical. So it's recommended to have technical guys to help. 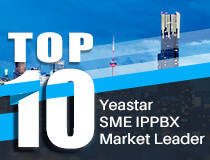 1) Connect the phone to the same network with Yeastar S-Series PBX. 2) Disable local DHCP server in your local network, e.g. disable DHCP server on Linksys router. 4) TFTP Server address is the IP address of your PBX. ​4. Upload configuration file to S-Series PBX and reboot phone. Upload file from Auto Provisioning app, Cisco phone will get TFTP Server address from DHCP Option66 and to download xml file from that TFTP Server (S-Series PBX). If not provision Cisco 79xx Phone successfully you can capture .pcap file and check with the signal flow.